Over the years I’ve been involved in a lot of developer hiring. Here I’d like to share a pearl of wisdom I gleaned from a colleague I shared the hiring process with. Their angle was to give extra points to people with experience with both building AND maintaining systems, i.e those who stuck around long enough to understand the consequences of their own actions. I found this is an interesting insight, the logic being that you learn the longer term impact of your design decisions from hanging around to fix the faults and add new features. But what does staying the distance actually teach you? I think the only real way is to find out for yourself, but here’s a few things that spring to mind. Simple isn’t easy, there’s an old saying that goes “I didn't have time to write a short letter, so I wrote a long one instead”. The same goes for code; finding the underlying simplicity can take significantly longer than just bashing out the first thing that comes to mind. However the long term payoffs for system maintenance can be huge. Tests can be a good thing, and test-driven development (TDD) can provide a helpful suite of regression tests to move forward with. However if the end result is tightly-coupled tests then the the pattern might be better coined Test-Driven Concrete (TDC), as instead of making change easier the product becomes almost impossible to maintain (thanks to Ian Johnson for the metaphor). Instead of testing at the class and method level you should be testing required behaviour. If you’re embarking on a big shiny new project, it might make sense to have some developers around who’ve been through the mill and come out the other side, and can help guide you to a more maintainable future. Microsoft’s C# programming language first appeared in 2000, over 15 years ago, that’s a long time in tech. "The collapse of the .net ecosystem" @ http://t.co/doKJ712Kqm Wrote this six months ago and didn't want to offend people by publishing it. The article shows, through a series of charts, the level of interest in C# peaking and then falling. This is what I’d consider to be the natural continuum of things, where languages have their day, and then slowly decline. 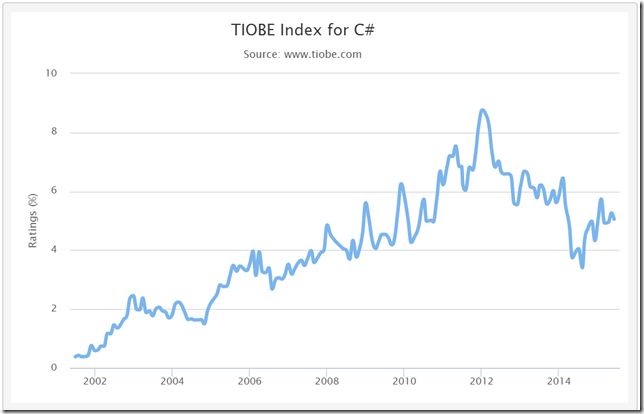 In the past C was my primary language, then C++ and so on, why should C# be any different? Disclaimer: This is not a leaving .Net post, just some of my own research that I thought I’d share, with a focus on the UK as that’s where I live. This chart appears to show job adverts peaking between around 2010 and 2012 and tapering off fairly heavily after that. On this chart the peak seems to be earlier, around 2009, perhaps the trend can be seen earlier in the UK, but again the decline in interest is clearly visible. Here the peak appears to be around 2012, although the drop is perhaps less pronounced. This chart shows uses a logarithmic scale, however what we might surmise, if the numbers are to believed, is that interest in C# appears to fall off a cliff towards the end of 2014. 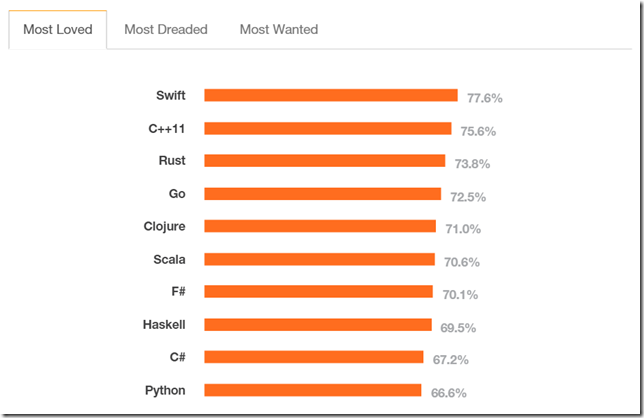 Probably not, there’s still plenty of C# jobs out there for now, and hell, some of the best paid jobs nowadays are for maintaining C++ and even COBOL systems. 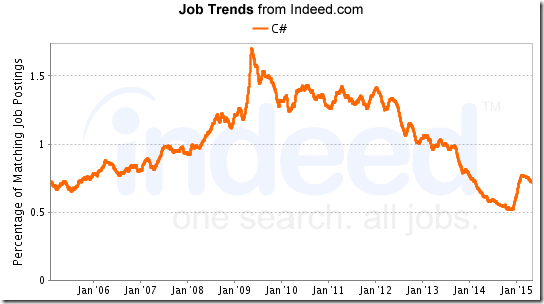 But if the numbers are anything to go by then we can say that C# interest has peaked. 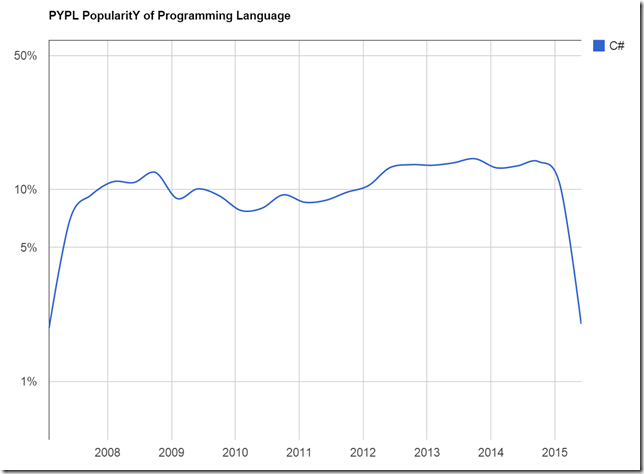 That said who knows what the future will hold and perhaps like C++ there’ll be a renaissance in the future, although C++’s renaissance never really brought it back to the levels of it’s heady hey days. Then again perhaps it’s more pragmatic not to dwell too heavily on the past, accept the numbers, and look to a new future. If you’re skills extend beyond one language then I guess you’ve probably got nothing to worry about, otherwise perhaps it’s time to pick up a new language and new paradigms. And I’ll leave you with a question: Do you think you’ll be using the same programming language in 5 years time? One of the biggest life lessons I learnt while at school, although I didn’t know it at the time, was from a PE lesson and a game called Rat. There were only a few rules to Rat: one kid had the ball and could throw at any of the other kids, when you were hit you were out, and the last kid left standing was the rat. Most of the kids would run and jump around trying to avoid the ball, but would rarely last the distance; the surviving rats tended to push others into the line of fire or better keep their heads down and find a place to hide. On reflection this seems to be a perfect analogy of the corporate world where “survivors” in a company are typically the ones who keep their head down and try not to draw attention to themselves. But where’s the fun in that, the real lesson for me was not to get too caught up in the “game”, if you’re hit you can just move on to a new one.